The Mill was founded in 1784 by Sir Richard Arkwright born in Preston Lancashire on 23 December 1732 - died 1793). Arkwright was the first large-scale user and possibly the inventor of the water frame (a cotton spinning machine) powered by water known as a spinning jenny. Certainly the Mill was powered by water through an 800 foot tunnel bored through the hillside from Campsie Linn. It ceased production between 1814 and 1823 and then acquired by Dennistoun, Buchanan & Co who spent £160000.00 (a vast sum in those days) on their improvement and employed 1200 workers. The cotton famine of 1862 occasioned another stoppage but since 1876 the works were greatly revived under the new and able management of Colonel Sandeman. Proof of Stanley's former dependance on the mill is the fact that by 1848 almost 2000 of the village's 2500 population (current figure 1274) was employed there. Until the introduction of the railway in that area in 1840, practically of all of the mill's production was taken in horse-drawn carts to Glasgow. It was the most northerly cotton mill in Great Britain. 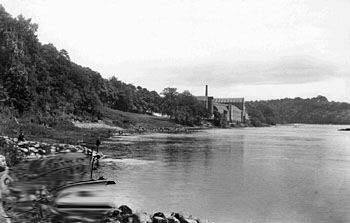 In 1921 it became part of Jute Industries along with many Dundee based flax and jute firms. It finally closed as a going concern in 1989. If you've any tales to tell about the mill or old photos you'd like to share then get in touch by clicking the email icon below.